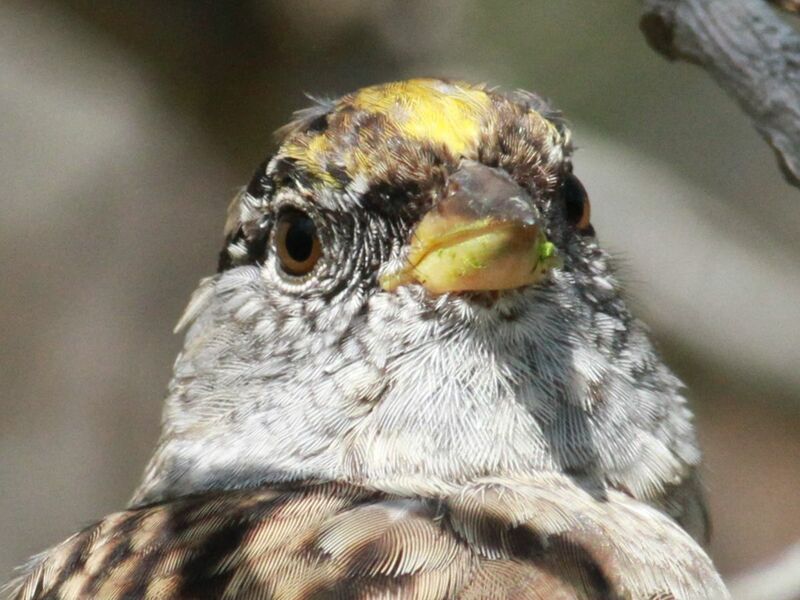 Bold markings on this golden crowned sparrow indicates a ‘powerful’ individual. Weary Willie’s distinctive call is waking up our neighborhood for the first time in five months. We might not have heard them except for the windows being down for the intense heat wave. Sometime late last week, the first Golden Crowned Sparrows arrived here in Davenport from their migration to British Columbia or perhaps Alaska. Bruce Lyon, a professor at UC Santa Cruz has been studying flocks at the UCSC Arboretum. He finds up to 50% (or more!) of the birds returning in fall migration. He has confirmed what many have noted – ‘high site fidelity’ – with the Arboretum birds. Bird banding makes all that possible; I wish I could recognize individual birds well enough to do that from memory. Individual birds are recognizable, and their plumage can tell you how high on the pecking order they reside. Lyon has also noted that the size and color of their golden crowns, the patches of yellow on their heads, varies with their status in their flock. The bigger and more striking the yellow, the more dominant the birds…including yellow patches on females that are dominant over duller males. Taking the time to distinguish and even name individual birds in our flock is fun and helps me to understand a little of what is going on in the yard. Welcome back Golden Crowned Sparrows!